Tesla lifts the piece of sirloin to his lips. Its volume is approximately .25 cubic inches, or .02777 of the entire steak. As he chews, he notices a waterspot on the back of his fork. He takes a fresh napkin from the stack at his left elbow and scrubs the fork vigorously. He is sitting at a private table in the refreshment stand at the west end of the Court of Honor. He looks out onto the Chicago World’s Fair and Columbian Exposition. It is October of 1893. The sun is long gone and the reflections of Tesla’s electric lights sparkle on the surface of the Main Basin, turning the spray from the fountain into glittering jewels. At the far end of the Basin stands the olive-wreathed Statue of the Republic in flowing robes. On all sides the White City lies in pristine elegance, testimony to the glorious architecture of ancient Greece and Rome. Its chilly streets are populated by mustached men in topcoats and sturdy women in woolen shawls. The time is 9:45. At midnight Nikola Tesla will produce his greatest miracle. The number twelve seems auspicious. It is important to him, for reasons he cannot understand, that it is divisible by three. Anne Morgan, daughter of financier J. Pierpoint Morgan, stands at a little distance from his table. Though still in finishing school she is tall, self-possessed, strikingly attractive. She is reluctant to disturb Tesla, knowing he prefers to dine alone. Still she is drawn to him irresistibly. He is rake thin and handsome as the devil himself, with steel gray eyes that pierce through to her soul. Tesla looks up, smiles gently. “Miss Morgan.” He begins to rise. She withdraws. Trailing a gloved hand along the balustrade, she tries to avoid the drunken crowds which swarm the Exposition Grounds. Tomorrow the Fair will close and pass into history. Already there are arguments as to what is to become of these splendid buildings. There is neither money to maintain them nor desire to demolish them. Chicago’s Mayor, Carter Harrison, worries that they will end up filthy and vandalized, providing shelter for the hundreds of poor who will no longer have jobs when the Fair ends. Her thoughts turn back to Tesla. She finds herself inordinately taken with him. At least part of the attraction is the mystery of his personal life. At age 37 he has never married nor been engaged. She has heard rumors that his tastes might be, to put it delicately, Greek in nature. There is no evidence to support this gossip and she does not credit it. Rather it seems likely that no one has yet been willing to indulge the inventor’s many idiosyncrasies. She absently touches her bare left ear lobe. She no longer wears the pearl earrings that so offended him on their first meeting. She flushes at the memory, and at that point Tesla appears. “Shall we walk?” he asks. She nods and matches his stride, careful not to take his arm. Tesla is not comfortable with personal contact. To their left is the Hall of Agriculture. She has heard that its most popular attraction is an 11-ton cheese from Ontario. Like so many other visitors to the Fair, she has not actually visited any of the exhibits. They seem dull and pedestrian compared to the purity and classical lines of the buildings which house them. The fragrance of fresh roses drifts out through the open doors, and for a moment she is lost in a reverie of New York in the spring. As they pass the end of the hall they are in darkness for a few moments. Tesla seems to shudder. He has been silent and intent, as if compulsively counting his steps. It would not surprise her if this were actually the case. “Is anything wrong?” she asks. In fact the darkness is full of lurking nightmares for Tesla. Just now he was five years old again, watching his older brother Daniel fall to his death. Years of guilty self-examination have not made the scene clearer. They stood together at the top of the cellar stairs, and then Daniel fell into the darkness. Did he fall? Did Nikola, in a moment of childish rage, push him? All his life he has feared the dark. His father took his candles away, so little Nikola made his own. Now the full-grown Tesla has brought electric light to the White City, carried by safe, inexpensive alternating current. It is only the beginning. They have circled back to the west, and to their right is the Liberal Arts Building. She has heard that it contains so much painting and sculpture that one can only wander helplessly among it. To attempt to seek out a single artist, or to look for the French Impressionists, of whom she has been hearing so much, would be sheer futility. Under Tesla’s electric lights, the polished facade of the building sparkles. For a moment, looking down the impossibly long line of perfect Corinthian columns, she feels what Tesla feels: the triumph of man over nature, the will to conquer and shape and control. Then the night breeze brings her the scent of roses from across the Basin and the feeling passes. They enter the Electricity Building together and stand in the center, underneath the great dome. This is the site of the Westinghouse exhibit, a huge curtained archway resting upon a metal platform. Beyond the arch are two huge Tesla coils, the largest ever built. At the peak of the arch is a tablet inscribed with the words: WESTINGHOUSE ELECTRIC & MANUFACTURING CO./TESLA POLYPHASE SYSTEM. Tesla’s mood is triumphant. Edison, his chief rival, has been proven wrong. Alternating current will be the choice of the future. The Westinghouse company has this week been awarded the contract to build the first two generators at Niagara Falls. Tesla cannot forgive Edison’s hiring of Menlo Park street urchins to kidnap pets, which he then electrocuted with alternating current—”Westinghoused” them, as he called it. But Edison’s petty, lunatic attempts to discredit the polyphase system have failed, and he stands revealed as an old, bitter, and unimaginative man. Edison has lost, and history will soon forget him. George Westinghouse himself, Tesla’s patron, is here tonight. So are J.P. Morgan, Anne’s father, and William K. Vanderbilt and Mayor Harrison. Here also are Tesla’s friends Robert and Katharine Johnson, and Samuel Clemens, who insists everyone call him by his pen name. He opens a panel in the front of the arch. A massive knife switch is revealed. Tesla makes a short bow and then throws the switch. The air crackles with ozone. 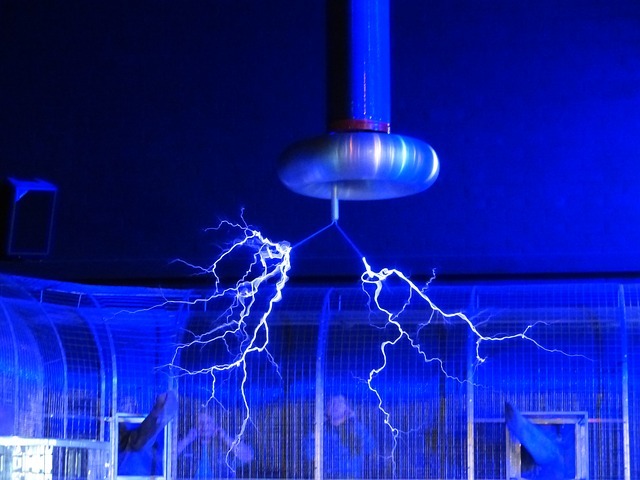 Electricity roars through Tesla’s body. His hair stands on end and flames dance at the tips of his fingers. Electricity is his God, his best friend, his only lover. It is clean, pure, absolute. It arcs through him and invisibly into the sky. Tesla alone can see it. To him it is blinding white, the color he sees when inspiration, fear, or elation strikes him. The coils draw colossal amounts of power. All across the great hall, all over the White City, lights flicker and dim. Anne Morgan cries out in shock and fear. Through the vaulted windows overhead the sky itself begins to glow. Something sparks and hisses and the machine winds down. The air reeks of melted copper and glass and rubber. It makes no difference. The miracle is complete. Already there are screams from outside. Tesla walks quickly to the doors and throws them open. Anne Morgan is one of the first to follow him out. She cannot help but fear him, despite her attraction, despite all her best intentions. All around her she sees fairgoers with their necks craned upward, or their eyes hidden in fear. She turns her own gaze to the heavens and lets out a short, startled cry. The sky is on fire. Or rather, it burns the way the filaments burn in one of Tesla’s electric lamps. It has become a sheet of glowing white. After a few seconds the glare hurts her eyes and she must look away. “For all time?” Westinghouse stammers. Tesla turns away. The reaction is not what he expected. Where is their gratitude? He has turned their entire world into a White City, a city in which crime and fear and nightmares are no longer possible. Yet men point at him, shouting curses, and women weep openly. He pushes past them, toward the train station. Meat machines, he thinks. They are so used to their inefficient cycles of night and day. But they will learn. He boards a train for New York and secures a private compartment. As he drives on into the white night, his window remains brilliantly lighted. In the light there is truth. In the light there is peace. In the light he will be able, at last, to sleep.